Survivors of the Aberfan disaster, which killed 144 people, mainly children, have joined bereaved relatives at a private service. A tip slid on to the village school and 18 homes on 21 October, 1966, leaving 116 children and 28 adults dead. About 100 people gathered at Aberfan cemetery to lay wreaths, among them some families who had never before attended on the anniversary day. Welsh sporting events will also mark the anniversary during the weekend. Welsh Secretary Peter Hain and First Minister Rhodri Morgan were among those who joined in the prayers as the wreaths were laid. A church service will be held in the village tonight. Elsewhere, Cardiff City players will wear black armbands during their game at Norwich on Saturday, and there will be a minute's silence before football matches in the Welsh Premiership and at rugby games. A documentary being screened on BBC Two Wales on Saturday will chart the progress of work being carried out by American artist Shimon Attie with the people of Aberfan to create new images of the village. The artist had never heard of Aberfan before going to the town, and wants to help provide the village with an alternative public face from the well-known pictures of the disaster. He said: "I'm trying to use modern art to help normalise the village. I want it to be merely an ordinary Welsh village amongst other Welsh villages." More than 40 people from Aberfan have taken part in the photographic and video installation, using objects from their daily home and working lives. The participants talk about dealing with the grief and stress of the disaster, some detailing the guilt they felt at surviving where others perished. None of them are being named, in a bid to allow them to remain anonymous once the exhibition is over. The finished pieces will be shown in the National Museum of Wales in the new year. At a service in Merthyr Tydfil on Thursday, Father Michael St Clair said: "I was asked several times, what do I think is the need for such a commemoration. 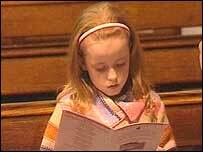 "We pray that all those who lost their lives are brought to that place of peace, light and happiness. "Why do we commemorate so many things? Because we are a people who remember. "Why are we here in these valleys? Coal is responsible. "In those days they didn't realise what they were doing, in our days we are so concerned with global warming and the effect on the environment. "What can we do to make things better for the future?" At Thursday's service, First Minister Rhodri Morgan called on the people of Wales to remember those who died. 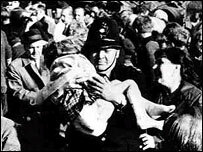 He said: "Everyone can remember how they heard about Aberfan. "I first heard about it on the lunchtime news that day and found it hard to make sense of the horror of it - the fact that a primary school had been buried, that so many children had died and the scale of the rescue operation. "This was the 1960s. Wales still had 100,000 miners and coal was king. Coal was so important that we all accepted - until Aberfan - that there was a price to pay and we were all prepared to pay it. "What we never foresaw was that coal could take the lives of our children. That was new, and terrible." The landslide of muddy coal waste demolished Pantglas Junior School and neighbouring houses. Readings at Thursday's service were given by councillor Jeff Edwards, one of the pupils who survived the disaster at Pantglas. The mayor of Merthyr, Ian Clark, said: "We pray for the families and friends of all who died that they may draw comfort from their faith and the support of the community." Cliff Minett, who lost two of his three children in the disaster, said: "It doesn't matter if it's one year or 40 years on - the pain is just the same." 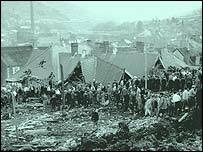 An American in Aberfan is on BBC Two Wales on Saturday, 21 October at 2000 BST.